Finally got around to finishing the series the other day and, hell, I needed somethin’ to post anyway, so it’s fairly convenient. Now, I’ve never played too much of the game and I’ve heard that the tone of the anime couldn’t be more different, so… I’m gonna go on what I know about both of ’em, because that’s only fair for an adaptation. Anyway, let’s get goin’, but keep in mind that I’ll be spoiling the whole plot. In terms of quality, the show’s pretty decent. I didn’t notice any huge off-model moments and, except for the weird use of CGI in some cases, I didn’t have any problems with it. I was particularly fond of the music this time around, which you guys know is a rare thing for me, especially the opening and ending. Major kudos goes to the final episode’s credits, which replaced the ruined, red-skied Japan with a pre-apocalypse variation of the same scene, complete with everyone who died (thus removing them from the credits) being back in their place. So, right, CGI. I don’t have a problem for it when things are supposed to look alien and ‘off,’ such as the Septentriones in this or the Noise from Symphogear. The giant clock in the JP’s headquarters? That has no real reason to be CGI. I’ve heard – or perhaps theorized myself, not toally sure – that CGI is just straight-up easier to do objects with, so it makes sense from a convenience standpoint, but… Eh. Least they didn’t have any obviously CGI cars (to my knowledge). Anyway, how about the plot? Well, I keep hearing it’s a darker, more seriously toned version of the game. From what I remember, that sounds about right and I’ve heard a few complaints about it, but… It works. The world is potentially ending, Japan’s gone to hell, and humanity’s on trial. It has every right to be dark and I feel like keeping it as light-hearted as how I remember the game being would have done the concept a pretty huge disservice. I’m also genuinely glad that they ended up making the series as long as it is, even if they had to cut a lot of stuff out. It gave ’em the chance to put emphasis on a handful of main characters and I genuinely enjoyed, hated, or flat-out wanted some of ’em dead. … Well, except Keita. He just seemed to be there in order to die and to show the audience that bad stuff is gonna happen to people you like. I’ve got some issues with the plot and how everything was presented, though. First, the running gag of Daichi’s demons being terrible (until he gets Jack Black Frost, I don’t care what the subtitles say) and him complaining about it. It seemed… really out of place and more like the kind of joke you’d see in a sitcom. My biggest issue with the entire series is the final fight. It’s the fight you’re spending pretty much the entire second half of the series waiting for: Hibiki against Yamato, as Yamato is all but straight-up evil. Hell, you know the fight’s gonna happen because Yamato forces Hibiki to promise passing judgment on him. Unfortunately, if presented in-game, the final fight would probably amount to a (short) cutscene and some dialogue boxes. The final showdown is less of a fight and more of ‘Let’s have these two guys talk while their demons punch each other.’ Okay, it sets up tension for when the real fight happens, I can get behind that. Then Yamato finally shows us that fusion does indeed exist and eventually creates Satan, which is pretty damn cool considering Satan’s usual role as God’s right-hand-demon in the series. 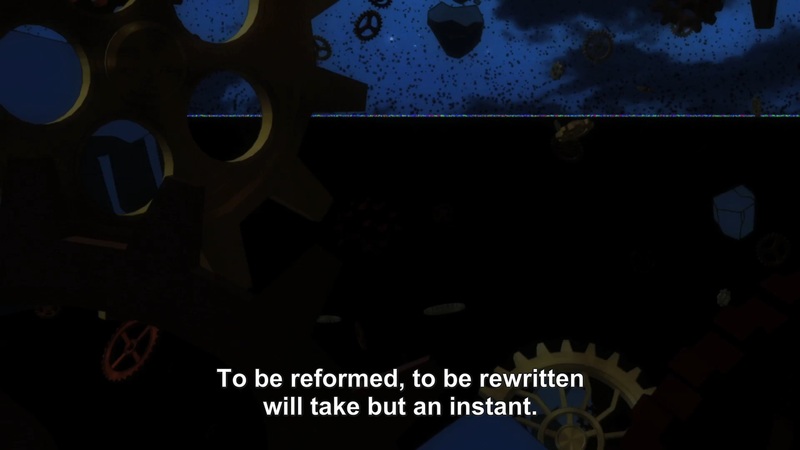 Hibiki then receives the demons from all of his dead friends, because the anime needed some deus ex machina in order for him not to get obliterated right then and there. So what does he make? He makes Lucifer (apparently using a bunch of game-authentic fusions, too!). So, we’ve got Lucifer and Satan staring each other down. 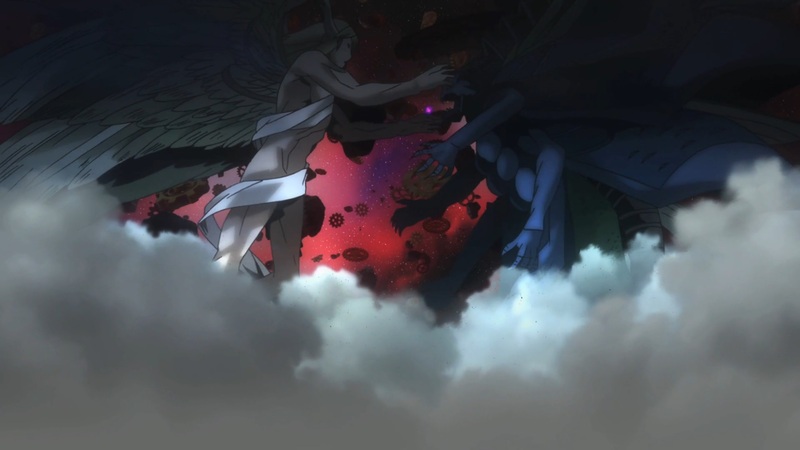 This fight could only be better if God and the Demifiend from Nocturne showed up, right? Wrong! Lucifer, instead of doing anything cool like throwing a big Hama at Satan or some Almighty spell… he hugs Satan to death. Not even an explosive, suicide-bomb hug like Alcor tried. Just huggin’ that fat, six-breasted nightmare. That’s my biggest issue with the series: They spend all of this time building up to the final fight and it’s going to be awesome, but nope. You get a man-hug and a flash of light to finish it off. Nothing says climactic end like two all-powerful beings enjoying each others’ loving embrace. Thankfully the ending is better, showing a less-horrific version of the first ‘dead face’ scene in the subway, then going over every character in a ‘what could have been’ kind of moment. 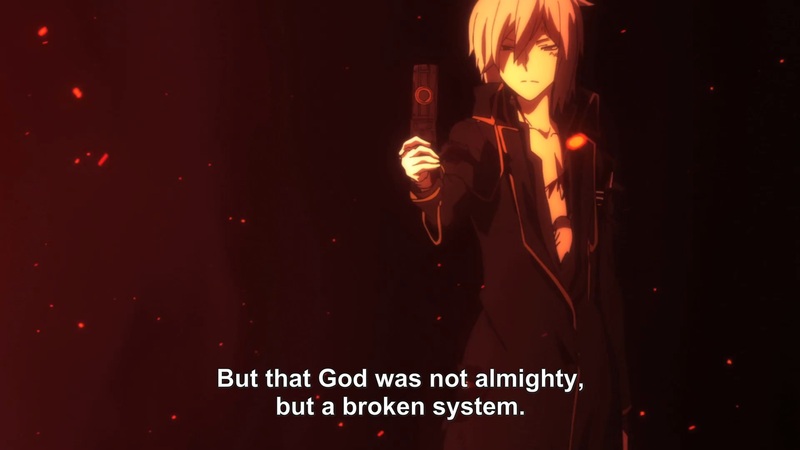 Yamato, Alcor, and Hibiki all seem to remember what happen, and humanity is presumably not going to be judged again. All in all, it’s not a bad series by any stretch of the imagination, especially for a videogame adaptation with multiple endings. They did a pretty good job of things, in all honesty. If you like the game, or are me and enjoy the idea but don’t have the time nor patience to play through the game, then go check it out and let’s hope that more of the MegaTen series gets a similar treatment. Anyway, thanks for reading and have a good’un. 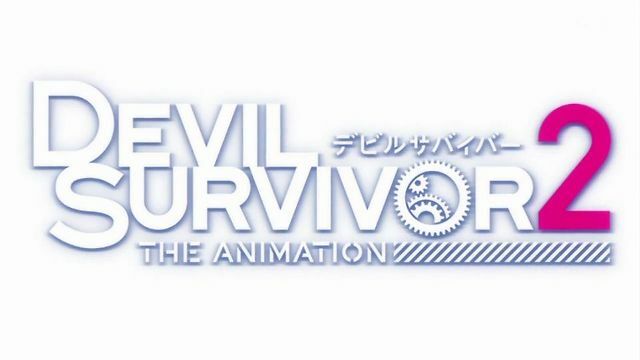 This entry was posted in Anime and Manga, Review and tagged devil survivor 2 anime, devil survivor 2 anime review, devil survivor 2 the animation. Bookmark the permalink. I have yet to catch up with this show. Can’t remember why I stopped watching. Is it worth my while to tart back again? It probably is if you’re a fan of the concept (everything goes to hell, humanity’s judged, so on so forth) or if you enjoyed the game. Although I’d finish anything you’re currently watching and thoroughly enjoying before hand. It’s not my first pick for somethin’ to watch, but it’s a pretty decent way to spend an evening.